The vast majority of recreational and tourist activities enjoyed in Florida are not regulated by the Florida legislature. Most tour operators have complete freedom to operate their business virtually any way they see fit. This usually results in a culture of maximizing profit to the detriment of customer safety. Warning, instructing, and training tourists requires time, and time is money. Fortunately, the Florida legislature has been proactive in regulating the boating industry, and specifically, jet ski rentals. Under Florida Statute 327.54, anyone renting jet skis to the public, whether for a guided tour or independent use, must provide certain training and instruction prior to the rental. This includes training regarding the operational functions, navigable rules, safe practices, and local hazards. The law allows only certified instructors to provide the mandatory training, and the participants must sign off that they received the training. Additionally, all renters born after 1988 must now pass a written examination covering jet ski safety at the rental site prior to the rental. 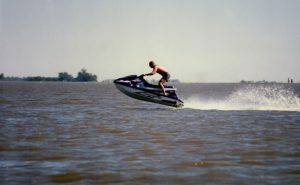 These safety requirements are a result of the enormous amount of jet ski collisions that have occurred throughout Florida as the industry has soared. Clearly, these jet ski statutes promote safety for inexperienced renters and anyone who may come in contact with them in the water. In our experience, however, these statutes are violated all too often. Jet ski rental companies simply do not spend the time to train and instruct rental customers pursuant to the statutes. They advertise to the public that jet skis are safe, entry-level devices that require no previous experience. They then rush renters through the process and place them in the water to operate these dangerous instrumentalities with virtually no training and hope for the best. In many cases our firm has handled, our clients were provided with no training or instruction at all.